At 2 o’clock in the morning we steamed out of Moss Vale and towards Sydney. Despite the severe cold and the bad bed I slept splendidly. We had made good use of the day before being on foot without interruption from 6 o’clock in the morning to midnight. I found everybody on board very busy with decorating our ship most brightly for the ball in the afternoon, the officers and the men competing in the effort. Tents had been set up on deck, electric lighting effects prepared, flowers, plants, flags and carpets lay ready to be used for decorative purposes. As much as the noise caused by these preparations permitted, I tried to sleep a little bit longer, and then drove towards 10 o’clock on land where the kind minister of education was waiting for me to watch a demonstration of a machine shearing a sheep. Even though it was not the season for such a procedure, one of the big wool companies had set up one of their machines to show me the procedure — a sign of the friendly reception we enjoyed everywhere in New South Wales. The sheep shearing machine was similarly constructed as our horse shearing machines and are powered by steam and work exceedingly fast without harming the animal in the slightest. Something that happens very often during a manual shearing. Furthermore the resulting wool is very smooth and it shears off everything to the last atom. A man is capable to shear 120 to 150 animals per day. The highest performance that a very skillful and worker is capable of achieving is shearing 200 sheep. I tried personally to shear a ram and thus was able to personally witness how simple it was to handle the machine and how splendidly it worked. My example found many imitators among my gentlemen and other spectators so that the elegantly dressed group of gentlemen engaged in shearing sheep provided quite a comical sight. In the large magazines of many floors we passed through are stored many thousands stapled wool bales awaiting to be shipped out, representing an enormous capital value. From here the minister accompanied me to a large meadow in a public garden where the natives were to demonstrate throwing boomerangs and spears. A black man from Western Australia, a truly hideous sight, demonstrated this art of his people in throwing the boomerangs made out of iron and wood and shaped like a scythe in different manners so that they always returned to him. Soon these projectiles rose straight up into the air, rotating constantly, soon they formed a circle or an ellipse and fell down at the feet of the thrower. Then they flew for an extended distance swooshing a meter above the ground only to suddenly rise high up etc. Finally the Australian discus thrower threw two boomerangs at the same time in opposite directions, so that their paths crossed before they returned to him. A correctly thrown boomerang kills a human due to its enormous flying speed. The long distance spear throwing was as interesting. Even at a distance of 200 paces the thrower was very accurate in his throws. An object of great pride for Sydney is its art gallery whose collection has only started a few years ago, and I gladly followed the desire of the city to pay it a visit. As neither effort nor cost have been spared for the acquisition of art works, the gallery already contains a great number of sometimes very remarkable pictures. 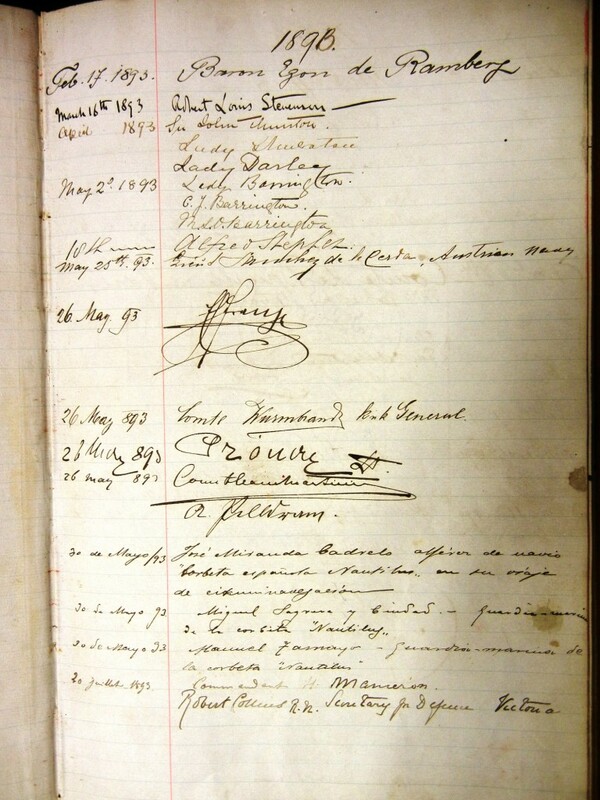 The signatures of Franz Ferdinand and his gentlemen Wurmbrand, Pronay, Clam-Martinic in the visitor’s book of the Art Gallery of New South Wales in Sydney, Australia. Courtesy of the museum. I found here many works I already knew from the exhibitions in the Viennese Künstlerhaus. 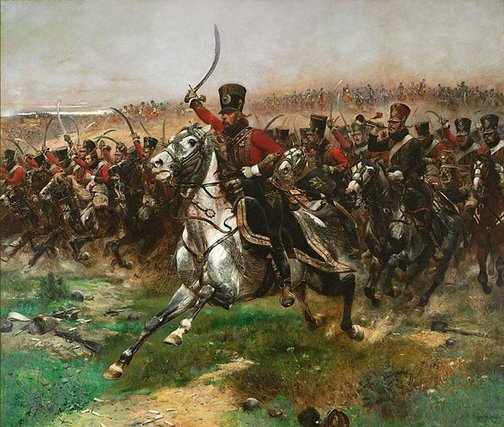 Especially an impressive battle painting by Detaille caught my eye, a cavalry attack of French hussars in the year 1809 [actually 1807] which has recently come into possession of the city. 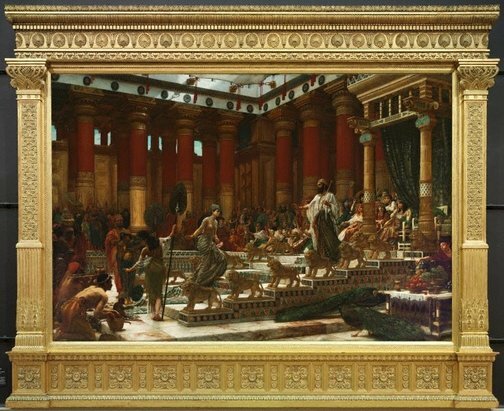 Then a much admired picture of the Queen of Sheba’s visit to Solomon, in which the figurative part is well done, namely the queen whose dress the artist has seemingly interpreted quite freely. Otherwise the picture makes, for my taste, a too colorful, given the richness of the colors an almost screaming impression. The most modern aberration, open-air painting is represented by audacious master works, while among the pastels there are only few of them but those of a very good standard. It is worth mentioning especially a study, the head of a young girl. In the comprehensive and quite solid water colors department, landscapes are given prominence. The visit to the gallery demonstrated to me that in Sydney there is much interest and understanding for art so that the city will soon own a very comprehensive collection of high artistic value if it continues to follow its current path. Breakfast was eaten in the formidable Australian Hotel whose director, a Saxon, asked us after the lunch to go up to the tower of the hotel to enjoy a truly splendid view of Sydney and its suburbs. From a bird’s perspective Sydney impressed me by its large extended area. The city lay in front of us like in a large scale painting surrounded by a ring of hills, gardens and bays, coming alive by the stream of humans and vehicles. Unfortunately we could not enjoy this view for long as it was time to return on board where the last preparations for the ball had to be made. After 2 o’clock the ship was in full gala. Everything was ready and we could calmly await the arrival of our guests as the artists on board had exceeded even our audacious expectations and the ship indeed looked most splendidly. The middle deck had been transformed into a richly decorated ball room by the erection of a tent in which were placed flags, palm trees and other plants. The interior was ornamented with blue-white linen, while the outside ship parts on deck were covered with black and yellow canvas. This produced a very friendly and cheerful impression. For the music band a high stand had been erected above the stairs and the bridge from which both our, the English and the Australian coat of arms were displayed while the companion deck was surrounded by small tables as it was intended as a buffet for the dancers. All kinds of objects had been transformed into elegant seating furniture. Even the large carpet covered containers in which the corals collected on Thursday Island were stored in water had to serve as canapés. In a lovely way the iron deck had been turned into a saloon. Heavy carpets lay on the floor and a dense wall of palm trees and flowers closed off the room towards the exterior. in each corner were spots that invited tired dancers to rest there while in the middle of the saloon a happy spring fountain splashed water out of a tuff basin. Strange in the midst of this room dedicated to a happy conviviality stood out the large 24 cm gun — an earnest contrast to the cheerful event that was soon to happen here. In the battery was a buffet for the older gentlemen and the non-dancing members of society. The prepared large buffet in the officer carré however was only to be opened after the cotillion to provide ample refreshment to the hungry and thirsty on small tables. My saloon was serving as a wardrobe. The cabin of the captain as the ladies‘ wardrobe. Here only we had the assistance of a woman, a marchande de modes who was in charge of arranging the dresses and assist the ladies. Everything else, even the binding of the flowers and the most delicate decorative embellishments had been prepared by the rough sailors‘ hands. Our cook Bussatto was in charge of all buffets and displayed all his art — this time in good mood which was not always the case with him — most brightly exploring all his culinary fantasies. A legion of bowls of cold dishes that he had given the most varied perfectly executed were standing on the tables: rigged ships whose full sails were imminent for departure, palaces, basins with fishes, crowns, all kinds of imaginative land and sea monsters stood in a colorful row, so that the buffets almost resembled a toy store. Our Mahmood was at the head of a group of sailors acting as cupbearers and waiters. In his gold laced gala uniform he was an object of interest for all guests and he appreciated the curiosity especially of the ladies with a dismissive grin. With uncommon punctuality the arrival of the guests started at 3 o’clock partly in our barges and boats that we had sent out to land, partly in their own vehicles. To send out the invitations we had asked an English admiral who knew Sydney’s society more closely than we and only limited the number of invited guests to 300. Soon, however, there were 500 guests on board as many of the invited had taken relatives along. We however were not displeased as the ship had the capacity to easily host all those who had come on board and had considerably augmented the ring of beautiful dancers. Apart from the most honorable dignitaries of the city almost only ladies and gentlemen eager to dance had come and I have to admit that I had never before seen so many beautiful girls and ladies assembled on a ball. The ladies of Sydney combined the beauty of the motherland’s country with the Southern graceful moves and the perfect elegance in appearance. While the music band played some numbers, the ship was closely inspected by the guests. Then the dance started to the sound of the „Blue Danube„. For the dance besides our officers and cadets were also invited all the officers and cadets of all the ships of the Sydney squadron and the Spanish corvette which had arrived two days before in Sydney. As the foreign sailors were nearly inseparable from the buffets and the smoking rooms during the whole ball, only our own gentlemen gave the honor of dancing without being able to fully satisfy the dancing desire of the numerous ladies who had arrived from Sydney despite the eager support by the local gentlemen. The dancing was enthusiastic. Even our captain and Wurmbrand joined in. Thanks to the attractive ladies, some of which were able to speak German or French so that I was able to engage in lively conversation with them, it was a pleasure to dance. We encountered a courtesy among the gentlemen and ladies of Sydney which did not fail to make its effect. The open unaffected character is combined with a natural kindness — qualities which ease the exchange all the more as despite the honoring the ruling social norms a more open concept of conventional forms was practiced than it is common at home. Thus ladies addressed the word to gentlemen who had not been introduced to them beforehand without inhibition — which could happen all too frequently due to the number of arriving people — and greeted both in meeting and leaving everybody with a handshake. Shortly before our arrival a banking crisis that had been looming for a long time had hit Sydney caused by overtrading and other reasons which deeply shocked the markets in all areas and was not only reported in the European newspapers but was also felt by the London stock exchange by wide fluctuations. All tiers of the population were negatively affected and had had to bear important losses. Even during our stay, the economic calamity was still going on. Even though our guests seemed not to be affected in their good mood and cheerfulness, so that one could even hear some witty remarks about the crisis but no laments or complaints. The cotillion arranged by Ramberg — a new choreographic spectacle for Sydney — pleased our guests immensely. The oldest figures of home such as the tunnel, the eight, columns etc, attracted the most vivid applause and with the final rounds with bouquets and the black and yellow bands the excited mood reached its high point. Accounting for the cool weather at the moment and having no gifts of meteorological divination to know that the evening would be so mild we had announced the ball to take place in the afternoon and set the time of the event from „3 to 7 o’clock“. In Sydney they seem to respect punctuality both in the time the guests arrive as well as when it is time to leave in order not to create a hint of appearing immodest in staying too long. Towards 7 o’clock began a general movement of departure. Our insistent pleas and words were in vain. The girls and young ladies were on our side; Mothers, fathers and husbands showed no mercy. Only a tiny group of faithful stayed behind with us, enjoying the dance for a long time and only leave „Elisabeth“ at an advanced hour after happy hours spent cosily on the iron deck. We can rest well on the honestly and eagerly won laurels and be proud about the unanimous praise of the guests that no warship that entered Sydney had given such a party that was as beautiful and as successful as that on board of our „Elisabeth“. ANNO – on 26.05.1893 in Austria’s newspapers. The k.u.k. Hof-Burgtheater is playing „Torquato Tasso“. The k.u.k. Hof-Operntheater is performing the opera “Freund Fritz”. Dieser Beitrag wurde am 26. May 2018 von wordpressadmin in diary veröffentlicht. Schlagworte: Australia, May, sightseeing, Sydney.